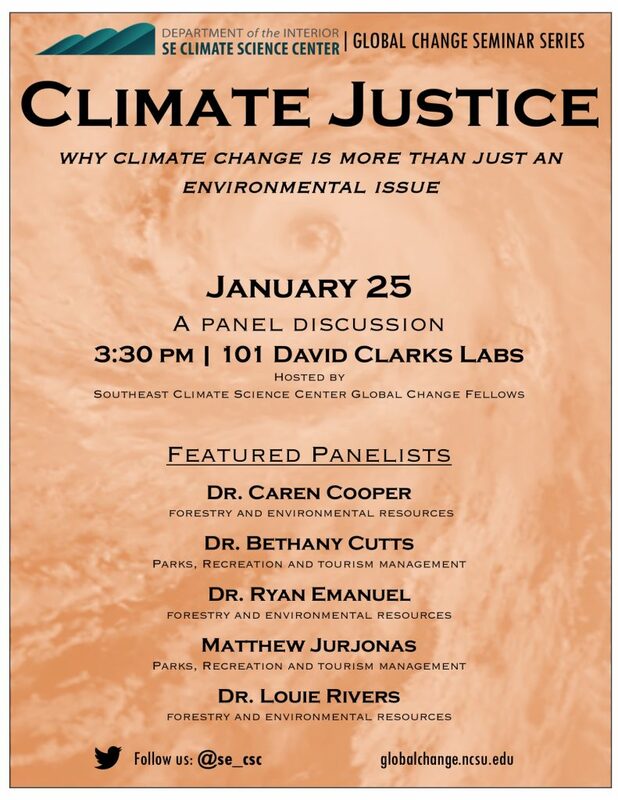 Join the SE CSC Global Change Fellows in a conversation about climate justice perspectives and research from NC State faculty and graduate students. We will explore the differential effects of climate change and the ability of populations to mitigate and adapt to the negative consequences of climate change. Is there a moral obligation to assist communities that have not been part of the climate mitigation conversation? How have communities been resilient in the past, and what adaptive resources should our institutions deploy? What ethical and social issues will be exacerbated by climate change? We invite you to listen, discuss, and explore these questions and more with our expert panel, as well as come with any questions or points of discussion that you would like to see a part of the conversation. Meeting number and access code are both 997 845 790. Contact cari_furiness@ncsu.edu if you have questions.